Does anyone have any recommendations for Door County? We will be there for about 5 days in August with my wife's family. I think we will be in Sister Bay. We were there last year. Ate at a decent fish boil; a good old school hamburger place; and a Swedish restaurant. If anyone has any other recommendations for the Sister Bay area or beyond, I would appreciate it. We were up there last year over the 4th, part camping, part relaxing. Mission Grille in Sister Bay: somewhat upscale, rather pricy, very tasty, but perhaps a little pretentious. That makes it pretty much quintessential Door County, I guess. Decor is very nice, it's an old church. D'Amico's in Sister Bay: Tiny spot, great homey Italian, cheap. Mr. Helsinki in Fish Creek: I think this is the Swedish place we had brunch at after leaving the campground. Pretty good, friendly service, nothing to write home about. Fun bar food. Nothing special, but cheaper than many other spots 'cuz it's on the interior of the peninsula. Some other notes: There's a deli just south of Sister Bay with great gourmet stuff for picnics etc. They had a goat-cheese-stuffed marinated tiny peppers (slightly spicy) that I'd drive back there for. The Ephraim Inn B&B does pretty good Breakfast, I found their Bed to be too cute for my tastes, although quite comfy after several days sleeping on the ground. Speaking of camping, I hope you have your reservations if you're doing so -- they fill up early. I highly recommend Newport State Park: Only 16 campsites among thousands of acres. We were a good 1/2 mile from the nearest site, and 2 miles from the parking lot/trail head. Isolation is nice. *Pick up free copies of "The Key To the Door: Illustrated" and the "Door County Go-Guide" available at pretty much every gas station and store. They will definitely help you plan your trip, and have hours of operation (lots of things close early in DC). *Drive (or walk) over the "old" bridge that connects the east and west sides of downtown Sturgeon Bay. 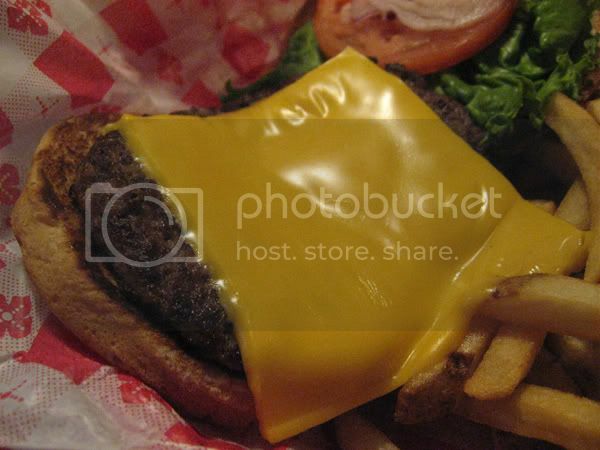 Have lunch at Perry's Cherry Diner (50s malt and burger shop). Then stroll down Third Avenue and check out all the little crafty shops. *If you have children, take them to THE FARM (their spelling, not mine) for an authentic petting zoo/farm experience. I haven't been there in 10 years, but I hear that it is still the same as when I was a kid. This is just north of SB on 57- I don't think they have any food options, but it is a fun place. *Take Highway 42 (not 57) to head north on the Peninsula. Skip Egg Harbor. Park in Fish Creek and shop; there are lots of crafty stores along the lakefront. Not Licked Yet Frozen Custard is in FC, and is quite good and kid-friendly. Skip Ephraim. 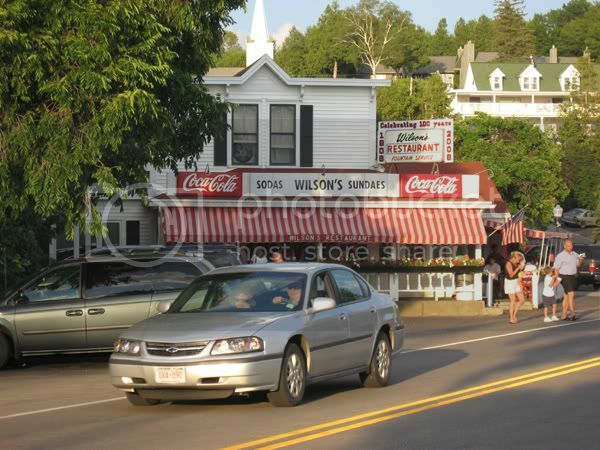 *Sister Bay: home of Al Johnson's Swedish Restaurant and Butik. At lunch and dinner, this place is PACKED. Do not even attempt to go during peak hours. Try to catch the end of lunch before the service gets unattentive. There are 2 butiks: one in the restaurant and a much larger one across the street. Pick up a bumper sticker or t-shirt that says "Uff da!" *There are also a couple of other really cute restaurants in Sister Bay, one is a place called Beanie's- Mexican with outdoor seating and great margaritas (kind of weird for Door County) and also the Swedish deli/cafe which I believe is called Sister Bay Cafe. It is south of Al Johnson's on the west side of the road. *Skip most of the hoity-toity restaurants. The food is always uninspired. You're much better off with the local diners and cafes. Eat fried cheese curds! *There are also several farms on the roadside that offer fresh produce and canned everything. 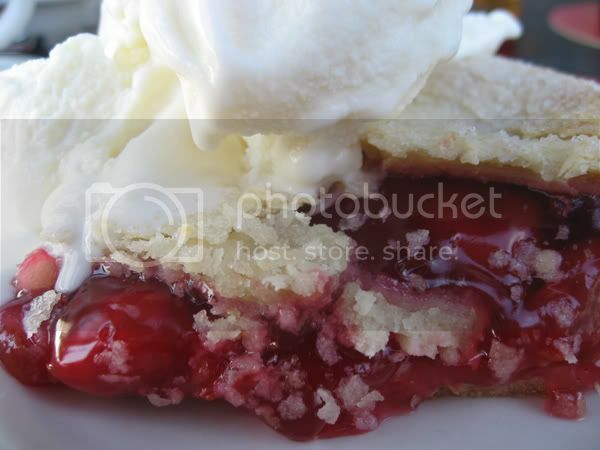 Cherries are still one of Door County's claims to fame, and they make a fine pie. The key to Door County (pun intended) is to take it slow. Every time I go, I have to leave my city slicker ways behind and adopt a much more relaxed pace. Take a stroll along the lakefront- the Green Bay side is much calmer and offers amazing sunsets. If you have any other questions, I would be happy to answer them as best I can. I guess I'm a little overzealous because Door County is a subject I know (too) much about! We go up to Algoma every year to visit some friends and spend a little time in Door, but not too much. My experience is that there is some interesting food in some of the stores (cheese, sausage and produce - fresh and prepared), but not a lot of good restaurants. 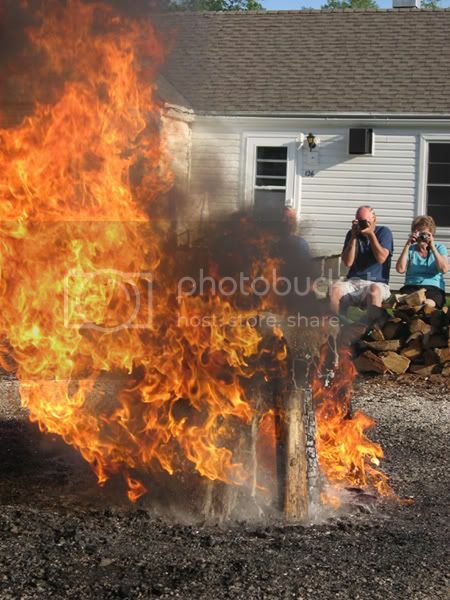 If you get lucky and hit the corn boil at the Kewaunee Fire Station, or this and that at the different fairs you do okay, but the food is mostly American and uninspired. I do recommend smoked fish at Bearcats in Algoma, and Country Ovens in Forestville for dried fruits (link: http://www.countryovens.com/). There is a good sausage place in Luxemburg, and a good cheese spot on 42 just north of Algoma, but I do not think either is unique. My advice - buy food and cook at home. Peryy's Cherry Diner has great breakfast, kind of a fun place, nothing fancy, but good. I really like Inn at Cedar Crossing for an eveing meal, we went last Aug. for my b-day and had a great meal, service is also very good. There is also a rest. almost next door to Westwood Resort in Sturgeon Bay that a lot of locals go to that has very good food at very good prices. Can't remember name of place, but someone else on this great site may. We've also found a lot of the food in area is just so-so and pretty pricey. I do love Door County Bakery, which has the best olive oil bread I've ever tasted and some other really great desert items. Hope that helps, we're going in Sept. so I look forward to other posts on this topic. 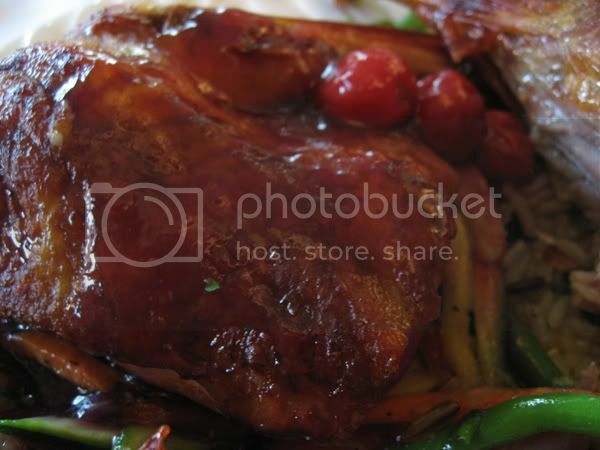 Entertainment aside, what I had for dinner there was actually pretty good: duck with Door County cherries. I forget what Antonius ordered but he asked that it be made with olive oil instead of butter and it came floating in a pool of oil -- ick (but maybe he shouldn't have even tried...). We also ordered a "Door County" wine and discovered from the label that the grapes were grown in Monterey County, California, and that the wine was "vinted and bottled" in Morgan Hill, California. There was absolutely no connection to Door County except that the label said "Stone's Throw of Door County". Someone like Vern would actually be a primary allure for me. I love local characters like that, who exist seemingly untouched by events of the past half-century. His very name says a lot. Check out "Nightingale Supper Club" in Sturgeon Bay. 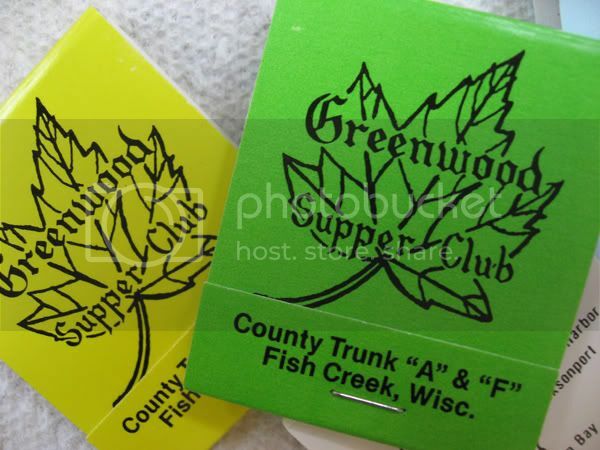 If you were to look up "Wisconsin Supper Club" in the dictionary, there would be a picture of this place as the definition-- Cheese buffet in the bar area, gargantuan portions of reliable prime rib and fish frys all at ridiculously low prices. If you want haute cuisine, avoid this place--- If you want a restaurant that has always provided good food and friendly service, put it on your list. Is there a listing of the most retro Wisconsin supper clubs out there somewhere? Hmm, I think I will start a thread. We were just in Door County last weekend, staying and eating in Bailey's Harbor. We went there for breakfast Saturday. The french toast with the warm cherry sauce was quite good. The cinnamon rolls at the next table looked gooey and lovely. They looked kind of like Ann Sather's, so if that's your thing, you'd probably like them (but I didn't try them). This restaurant has nightly fishboils on the half-hour (5:30, 6:30 and 7:30). This was an elegant, but somewhat overpriced restaurant. Our server was very professional and not too stiff. We had a lovely bottle of Erath Pinot Noir from Oregon to accompany our dinner. I had the venison special with a rosemary bordelaise sauce. It claimed to be medium rare, but was slightly more cooked than that. But the meat didn't suffer too terribly from the extra heat. It was still velvety and richly flavored, but not overwhelmingly of "game". The chili-garlic dressing on the garden salad was quite good. Mrs. Ro had the filet mignon, which was also an overcooked medium rare and not worth the $32 price tag. It was fine, but not special. When I'm paying above $30 for a hunk of meat, I want it to be special. Sister-in-law had freshwater lobster tail, which she really enjoyed (I didn't try it - I don't even know what a freshwater lobster is? A really big crawdad?). Brother-in-law had steak bleu, which got a decent review from him (I also didn't try). Both parents-in-law had the coq au vin, mom liked it, dad didn't. He felt the chicken (thighs - which I thought refreshing) and the mushrooms in the sauce were both badly prepared. For dessert, I had the flourless chocolate cake and it was perfect. Really perfect. A slight crunch to the exterior, a gentle softness, but no mushiness on the interior. Lovely. Sunday breakfast. The grapefruit juice was freshly squeezed and very sweet-tart. My main course was the "Tower of Power" - basically a walleye benedict. English muffin, spinach, walleye cake, grilled tomato slice, poached egg, and hollandaise. It tasted wonderful. But something in it devastated my usually robust constitution for about 90 minutes after the meal. It could have been the combination with the grapefruit juice, it could have been the oil the walleye cake was fried in, or it could have been the hollandaise, which was good, but a little bit heavy. Mrs. Ro had the spinach quiche, and she found it to be uninspired. Her review, "I should have ordered the granola." Those are the only three places I have ever eaten in Door County. If you're getting to Fish Creek, think about checking out the Skyway Drive-In Theater for some old-fashioned fun. I love Drive-in theaters. It makes even "Anchorman" (no classic) tolerable. My trips up north continue to be about food shopping and eating at home. None of the places I have eaten out were that wonderful (see elsewhere my thoughts about eating in Fantasy Land, or vacation paradise), being either boring or too precious - the Bride was thrilled with her burger with pesto mayonnaise at a lunch I was happy to miss. But I am pleased to see my favorite food providers are thriving. Country Ovens, of the dried fruits and cherry juice has expanded into a world of products I am avoiding (cherry salsa, cherry mustard, etc.) and trumpeting the fact that their products are now widely available in supermarkets across Illinois and Wisconsin. Wienke's canning business is booming, and I swear their stuff was in every food store I went into in Wisconsin. Their preserved fruit, jams, pie filling, etc are great, and I bought a jar of peaches that are just beautiful to look at. I am however, avoiiding their line extension as well, which includes a range of condiments "Made for" them. In their store they wisely segregate these from their locally produced and preserved fruits, but that was not the case elsewhere. The store, on Hwy S just north of Algoma, continues to add to their offerings, with some good produce, fresh pies at a good price, and they carry some interesting cheeses, too. We did a comparison of two raw milk cheeses, one cow's milk cheddar, and one goat milk "cheddar-style" - neither very exciting as it turned out, so I am back to Carr Valley and Renard's (a mile or so south on Hwy S) aged white cheddar. So far success has not wrecked either Wienke's or Country Ovens, though seeing their products everywhere makes visiting them a little less special. And the choice of butchers is always wonderful. Did not make it to Salmon's in Luxembourg this time (go for the twice-cured bacon, and fresh sausages), wandering up to the new Marchant's in Sturgeon Bay, an outpost of the original in Brussels, and yes there is a Belgian flavor to their specialties. Trippe is always good (no, not tripe, Trippe is a belgian sausage), fresh brats were great, as is the ring bologna which I am working my through - EC, it makes a great fried bologna sandwich, thanks for the inspiration. Still have to get to the potato sausage which I bought frozen. They also make Belgian Pies, a weird looking concoction I have not tried, but I could picture Chef Cantu doing an amusing riff on them (wish I did pictures in my posts). And no trip would be complete without a stop at Bearcat's Fish House in Algoma. He seems to be the only one who is not expanding, though I suppose since he and his wife work 7 days a week, at least 12 hours a day that is enough. The whitefish sausage with cajun or italian seasoning is great, as is most of the smoked fish - I went with a salmon filet, a salmon steak, and a trout steak. The pickled smoked salmon is not so good, but I was seduced into branching out by the wonderful pickled whitefish. And I always leave with a few Blind Robins, smoked, salted fish (herring?) that give a kick like anchovies but with a smoky touch. Another satisfying weekend - they do eat well, our friends to the north. So, before summer is totally over, I'll post some of my pictures from our Door County trip on 4th of July week. 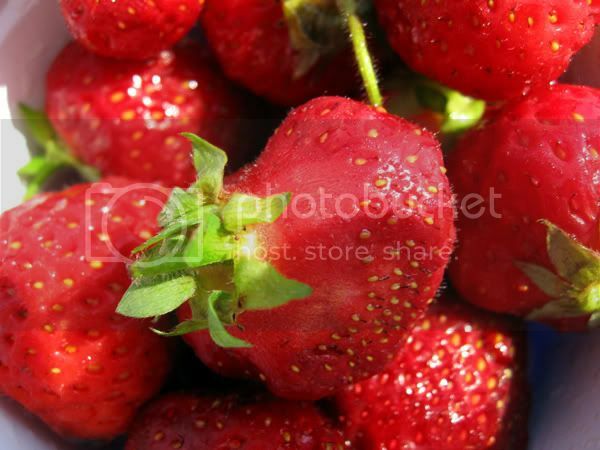 Here are some fresh Door County strawberries we had for breakfast one morning! 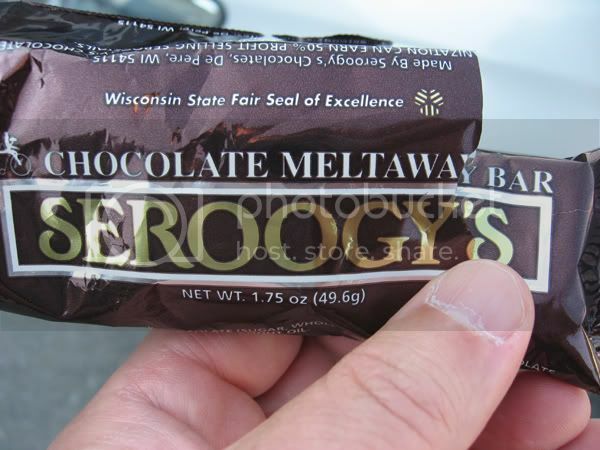 I'm hungering for Door County all over again. "Your pie is $9, right?" "The cherry pies we saw up in Door County are $15"
"How come yours are so cheap?" Sometimes it continues for a while after that, going into detailed queries on the ingredients, are they Door County cherries, etc. Most often, it ends without anything being bought - the conclusion having been reached that this cheap pie can't be any good, thus putting the whole place into question. It is a darned good pie at a great price, but they will never know. Great thread and posts...Nice pics, Riddlemay. We spent a week in Sturgeon Bay in mid-July, the annual family trip (I've been going since I was 3). We always hit the local supper clubs, such as the Nightingale in Sturgeon Bay and the C&C in Fish Creek, where you can get a nice steak/prime rib and soak up the local atmosphere. A couple of places I can highly recommend for more upscale dining are Sage Restaurant in Sturgeon Bay (assuming it's around next year), the Inn at Cedar Crossing (SB) the Whistling Swan (Fish Creek) and the Mission Grille (Sister Bay). Sage is very upscale, and perhaps a bit out of place in downtown Sturgeon Bay, but the meal we had there was wonderful. 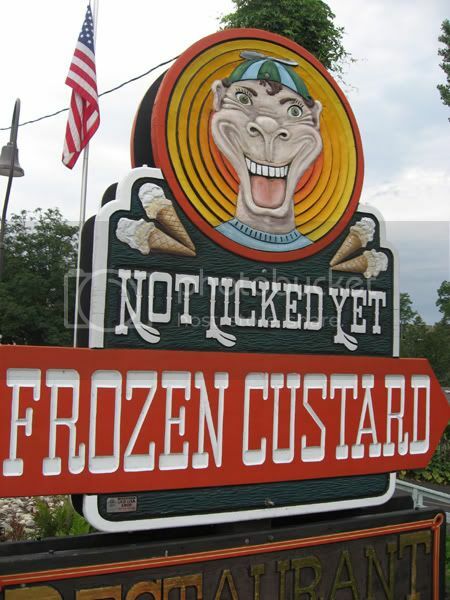 I tried several custard places in Door County a couple of weekends ago, but there is a reason that Not Licked Yet is so crowded. It was by far the best. I particularly enjoyed my vanilla custard topped with cherries and my sister's vanilla custard with snickerdoodles and caramel sauce was also excellent. New camera, right? You sure got the hang of the digital camera quickly. Nice pictures, very nice. To help folks searching for Door County recommendations, there was another Door County experience written about here. Thanks, G Wiv. (And thanks also to others for the compliments.) Yes, I'm very pleased with my Canon SD700IS! One of the things I like about it is that it seems pretty "user-friendly" compared to some others I looked at, i.e., various functions and options are relatively "close to the surface" (readily accessed without a whole lot of delving into menus and submenus) and intuitive. The learning curve was not too steep. And a nice percentage of the pictures turn out well. I grew up in Luxemburg, and am very familiar with Salmon's. http://www.explorewisconsin.com/SalmonsMeatProducts/ My grandparents lived next door to the Salmon family. Their bacon is fantastic for sure, as are their natural casing weiners. What does it for me, however, is their "raw beef". This is a steak tartare-style dish, best served on dark rye bread and slices of freshly cut onion. My mouth is watering just thinking of it!) I would suggest that it is not, in fact "raw" as much as it is cured. It is well spiced and just to die for. Another stop in the Door/Kewaunee County area that you mush see is Joe Rouer's Bar in Duval. (map) The burgers their are just about as good as you could hope for. The late Joe Rouer established a tradition of great burgers a long time ago, and his family holds that up today. "When we no longer have good cooking in the world, we will have no literature, nor high and sharp intelligence, nor friendly gathering, nor social harmony." My wife and I are heading to Door County soon. Any recent recommendations? We'll be staying near Baileys Harbor, but will probably travel around most of the peninsula. One highlight of our previous trip to Door County, a few years ago, was the fish fry at Sister Bay Bowl. They have an excellent, old school bar that makes top notch, Wisconsin-style Brandy Old Fashioneds. Go to a Fish Boil. And prepare to be disappointed. It's a highly overrated experience. DKoblesky wrote: Go to a Fish Boil. And prepare to be disappointed. It's a highly overrated experience. I guess there's room for all kinds of opinions. Shortly after my wife moved here (before we got married), we went up to Door County. And took in a fish boil. I wasn't entirely sure how she'd respond. She loved it. Still does. And so do I.
I had heard the fish boils weren't all that great, esp when a fish fry is available. But I'm curious if the difference between good and bad fish boils are that when done by a restaurant they can be good, but when done as part of a large public, touristy festival they are (not surprisingly) bad. Others may disagree (and I won't deny that it's a fairly "touristy" experience) but I have a soft spot for the fish boil at the White Gull Inn. I thought the fish was very tasty and I remember the Door County cherry pie was delicious You should definitely make reservations. I did not have a chance to search through these threads to see if it's already been written about (guessing it must have been) but here is the website just in case. My coworker recently went up there and I made a nice list for her. The * are the places I thought she would really like. Bistro 42 – Pretty good Italian food. I had an awesome walleye dish there. Menu looks like it has changed significantly since we went there so I am not sure if its still good. http://www.bistrofortytwo.com/ It is attached to the Door Peninsula Winery so they have a bunch of wines from there. I think you can do wine tours too but we haven’t done this one yet. There is a fruit stand later in the season right across the street. Awesome fruit, especially the door county peaches. Shipwrecked Brewery – Good beer, so-so food unless you order the BBQ items (pulled pork, brisket, ribs) otherwise its uninspired wraps and salads. The whitefish chowder is good. 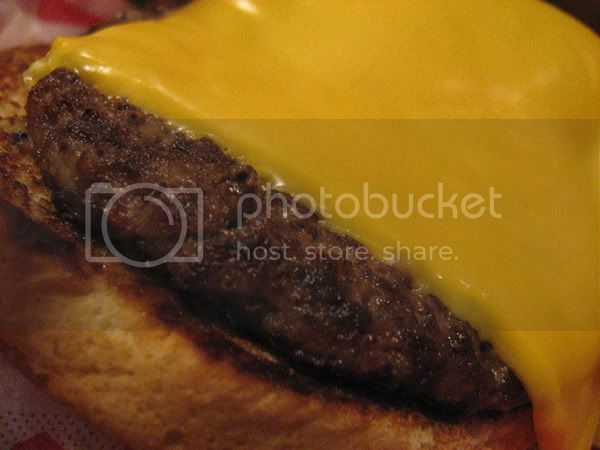 Casey’s BBQ Smokehouse – Great BBQ in an older supper club atmosphere. Haven’t tried anything but BBQ. *Wild Tomato Pizza – Awesome pizza and salads. I hear the burgers are pretty good too. http://www.wildtomatopizza.com/ Casual but not your typical pizza place. The grilled bread basket is tasty too. It’s very popular and very small so go early or late..or you might be waiting. (if it is warm the outside patio will be open, making more room). Ephraim *Warning: Ephraim is the only “dry” city in the entire state which means you cannot get beer, wine, or cocktails at any of the restaurants, which is why we have never eaten dinner in Ephraim. Leroy’s Water Street Coffee (just north of Eagle Harbor). Best coffee in Door County, good bakery items like muffins and scones. We usually get coffee and stuff and bring it back to the room. Al Johnson’s Swedish Restaurant. The only standout dish I have had is the Swedish Pancakes, which is what 75 percent of the restaurant is ordering in the morning. The home fries are awesome. Otherwise pretty standard breakfast fare. Never been there for any meal other than breakfast. DC Deli – I actually haven’t eaten here but people I have talked to say its awesome. Po Boys and home smoked meats. Summer Kitchen - Great breakfast. Espresso Lane – Good coffee and sandwiches. On Lake Michigan side. Gill's Rock – it’s the north end of Door County where you catch the ferry to Washington Island. There is not much there besides the ferry and Charlie’s Smokehouse, which has great smoked fish, especially the whitefish. Nearby is Newport State Park, which has nice hiking areas and is much quieter than Peninsula State park. There are some cool shops downtown Fish Creek. There are a couple of Olive Oil places there too where you can sample EVOO and different vinegars. 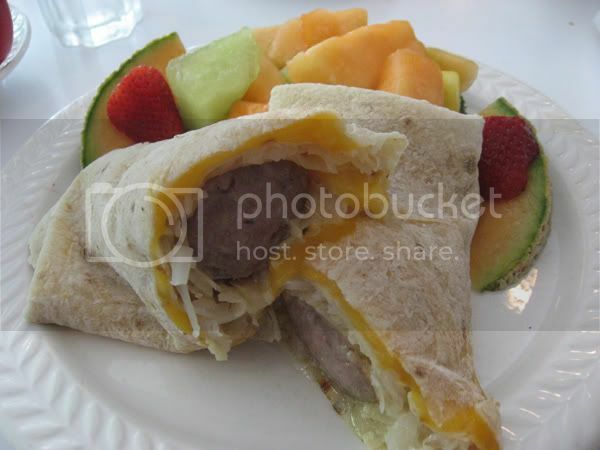 Alao here are my EatWisconsin reviews. You should try Sister Bay Bowl, if you haven't been there. At least the Friday fish fry. There's an extensive menu that includes lots of non-barbecue items as well. I'm definitely going back to try the ribs and pulled pork, both of which looked good going by my table. Casey's makes its own sauce. Despite a bit of cumin, not something I favor in barbecue sauce, it has a nice, vinegary-sweet tang. Inside, the bar and dining room are comfy and welcoming in a typical Door County kind of way. Casey's may not be on the level of a Honey One or Smoque, but definitely is one of the better places I've found to eat up here. We stumbled upon Casey's a couple of summers ago. I saw the pit and said "we gotta eat here." It's got that supper club vibe but with some awesome BBQ. I really loved the ribs and brisket. Chicken was overcooked. Shipwrecked does their own BBQ and its pretty good, but not as good as Casey's. I hear that DC Deli (Sister Bay) also has real BBQ but we haven't tried it yet. Seems like they all use Door County cherrywood, which is pretty cool and a unique way to set it apart from other BBQ found in the state.